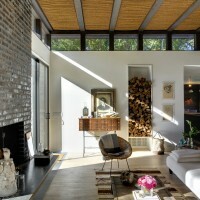 Bates Masi Architects have designed the Robins Way House in Amagansett, New York. 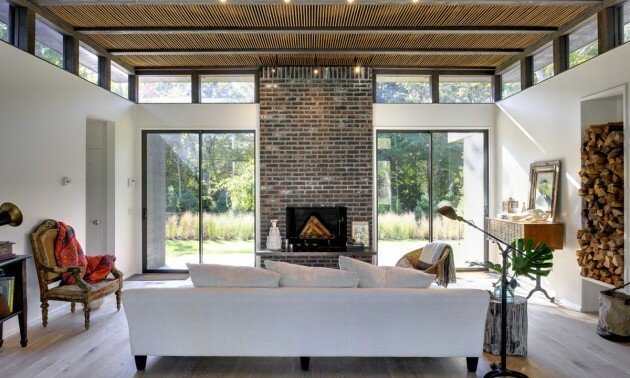 The clients, an interior designer and a DJ, requested a complete renovation and addition of a 1960’s kit house in Amagansett, NY to be a weekend retreat from their urban apartment. The clients gathered images of objects and conventional materials utilized in new, interesting ways as inspiration for the design. A single design solution that could unify the old remaining parts of the house to the new intervention was sought. This solution should solve acoustical, lighting, equipment coordination and simultaneously address the aesthetic décor requirements of the client’s collection of objects. A vocabulary was developed that allowed the patina and history that the client favored to remain and new experiences to evolve. The house was gutted and reduced down to the skeletal framework allowing the intervention to utilize the post and beam construction that remained. Between the existing ceiling joists, natural rope was woven through a digitally fabricated framework. Weaving patterns were used to signify different ceiling conditions. Lighting penetrates through a crossed weave of the rope. It transitions to a straight weave to shield speakers and utilities from view. Since the client is a DJ, sound is very important. The rope weave acts as an acoustic baffle absorbing background noise, but allows music from the ceiling mounted speakers to be emitted. To integrate with the décor, the rope was used structurally to support several items such as a large, custom steel framed mirror in the Master Bathroom and the Dining Room Chandelier. A large sliding door is woven with the same rope to provide privacy from the neighbors and shield the sun at various times of the day. 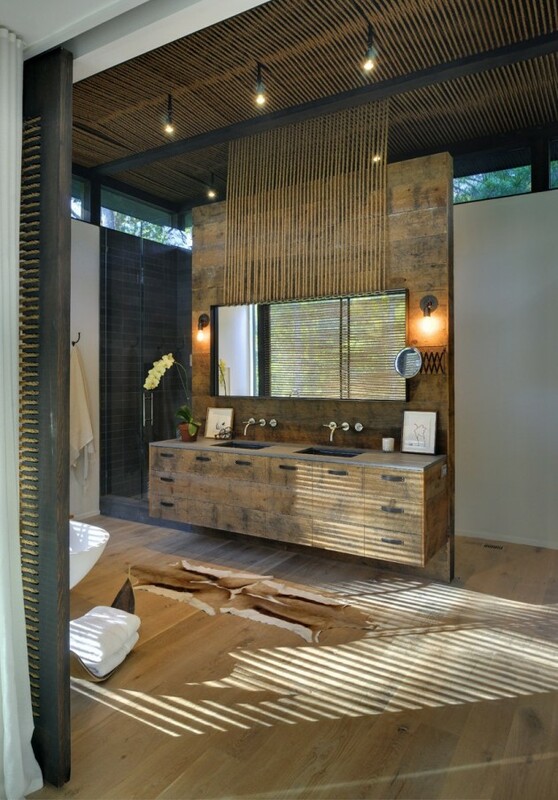 The sunlight rakes through the openings casting linear shadows on the bathroom floor. Unifying the exterior is a dark stained cedar siding that wraps all of the exterior facades and transitions to the matching frames of the replaced windows and doors. 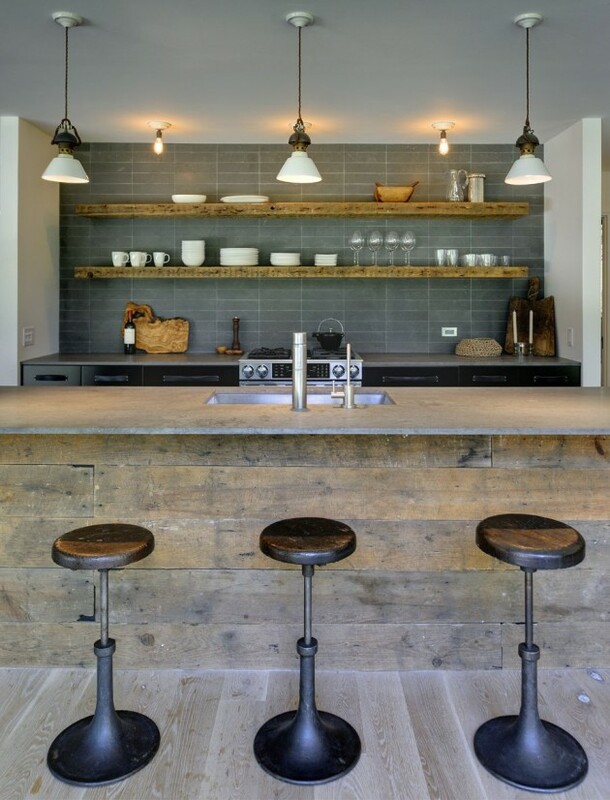 The newly constructed interior walls and interior cabinetry were also resurfaced in reclaimed barn wood. 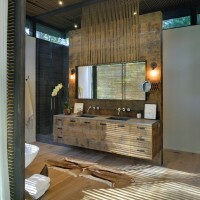 Behind a sheet of glass, the same reclaimed wood lines the shower surround and one feels as though they are showering outdoors. The clients now have a quiet escape from city life. The frequent turnover within a vacation community can be wasteful. Some are eager to tear down what exists and start new. This project preserved the skeleton of the house and the history in the patinaed materials that the client desired. 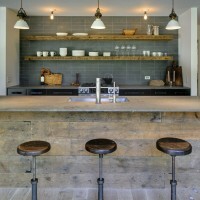 Conventional materials were utilized in new ways to unify the old and the new.